Having gone a little further, they came across a demon named Virad. Ram killed him then and there. 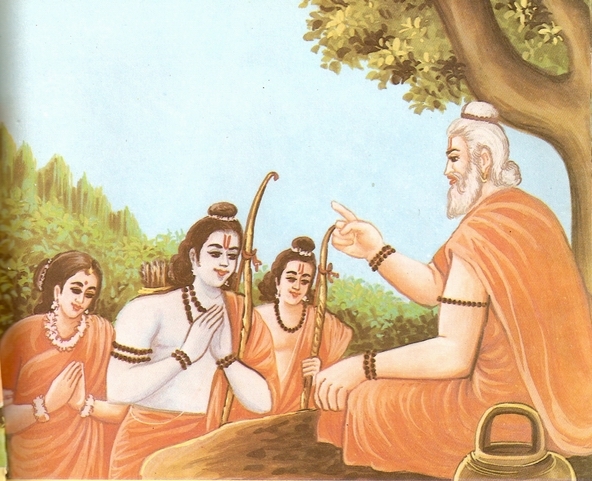 Now Ram came to the hermitage of Saint Agastya and sought his blessings. The saint gave them a few divine weapons as well. So Ram, along with his brother and wife proceeded to Panchvati. On the way, they met Jatayu, the king of Vultures. 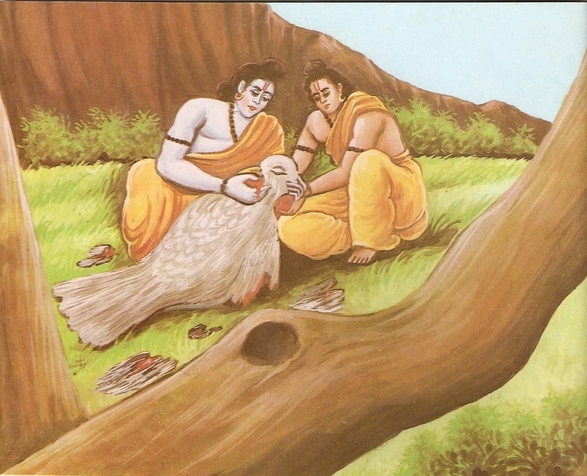 Jatayu introduced himself to Ram as a friend of King Dashrath and requested Ram to allow him to be with him. 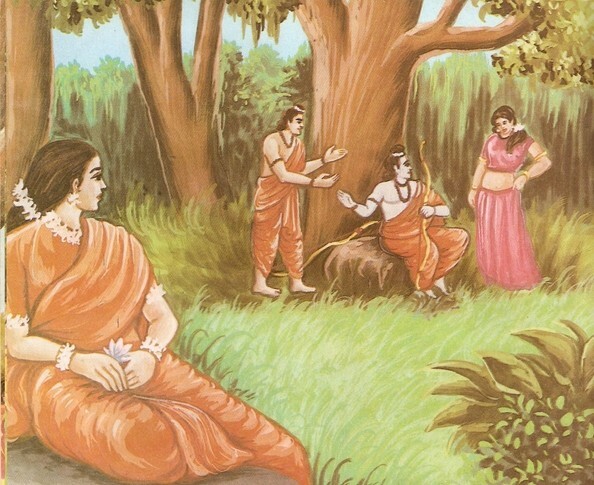 He assured Ram that he would be of immense use to him in the forest. 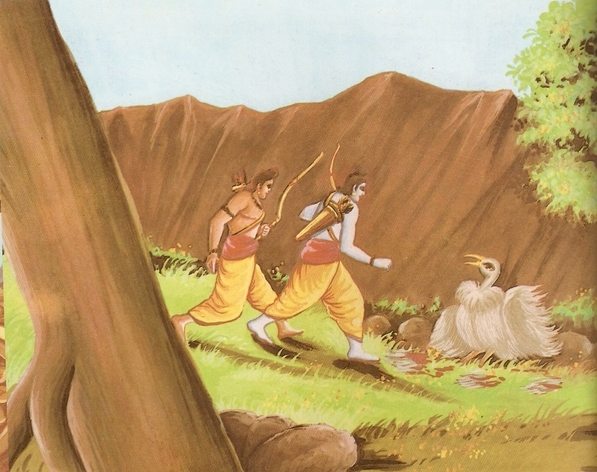 Ram agreed and Jatayu accompanied him. 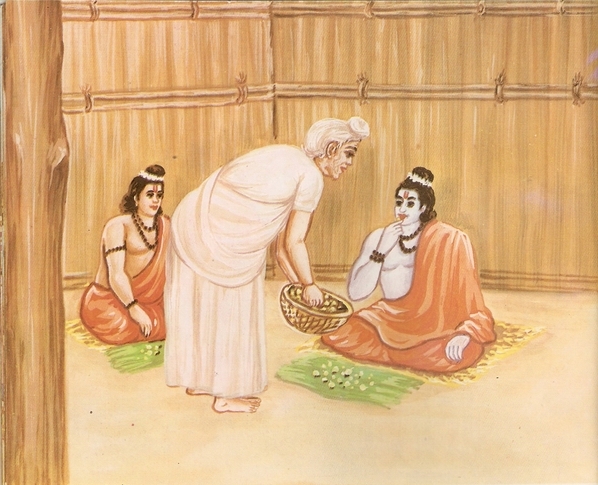 Both the brothers had a bath in the Godavari and then collecting a few lotus flowers, they worshipped the gods inside the hut. The hut was spacious and comfortable as well. So, they began to live there in peace. 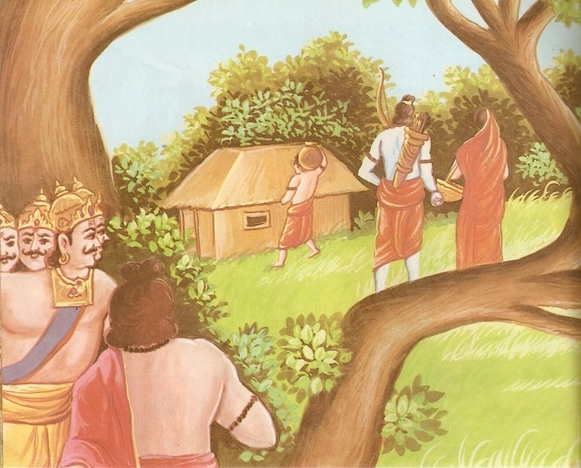 Lakshmana used to bring fuel wood from the forest while Sita used to cook food. Ram’s stay at Panchvati made the saints of the area quite safe and so they were very happy. Thinking so, she came near the Ram’s hut and changed her body. She came into the form of a very charming lady and hid herself behind a tree so that nobody should be able to see her. 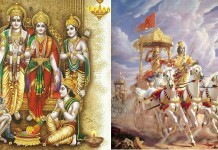 “I am the son of King Dashrath, the ruler of Ayodhya. I have been exiled for fourteen years. I want to pass this period her in peace. But who are you, O Gentle Lady? “said Rama. 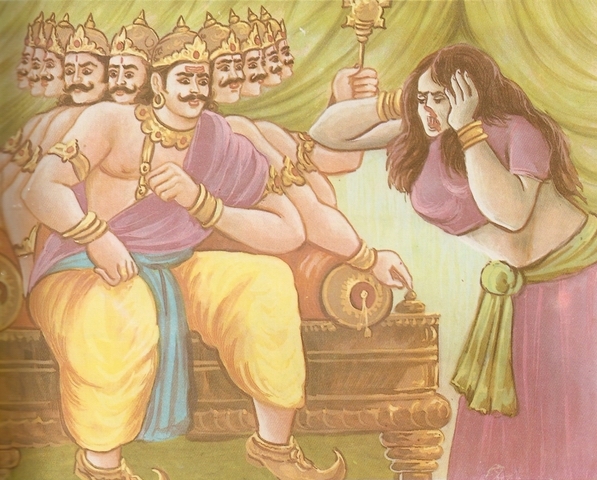 “I am Shoorpnakha, the sister of Ravana, the powerful ruler of Lanka. The governors of the area are my cousins – Khara and Dushan. They both are matchless warriors. I want to marry you. 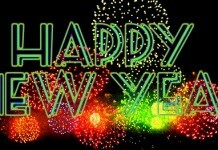 I am by all means a suitable match for you,” replied Shoorpnakha. “But I am already married. Here is my wife Sita. Well, that Youngman is my brother. 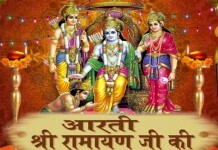 He is a nice match for you in every respect.” Ram suggested by way of joke. “No’ Saying so, Shoorpnakha flew into a rage. She came back to her demonic form and returned to Ram and said. “I see that you are not ready to wed me only because of this ugly wife of yours. So, I must devour her up and then you will marry me.” With these words, Shoorpnakha advanced towards Sita and pounced on her. 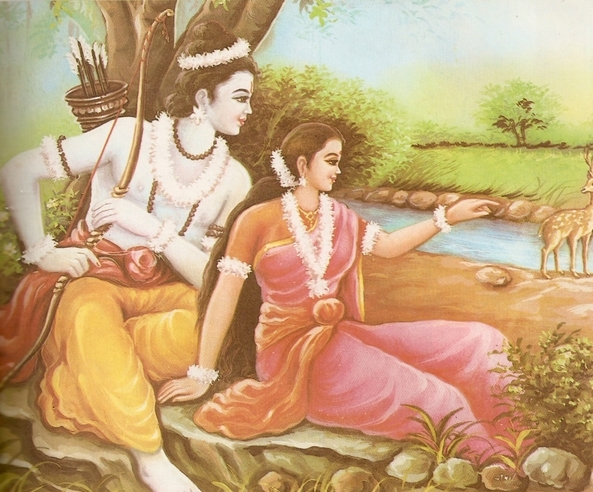 Lakshmana took Sita into a nearby cave. A messenger of Khara came to Ram and said, “My master Khara has ordered you to leave this place at once.” “We are warriors. We roam in the forest for game. We are always ready to face true warriors and never fear them. A true warrior, when he proceeds to the battlefield, never takes recourse to tricks. It is sheer cowardice,” retorted Ram. 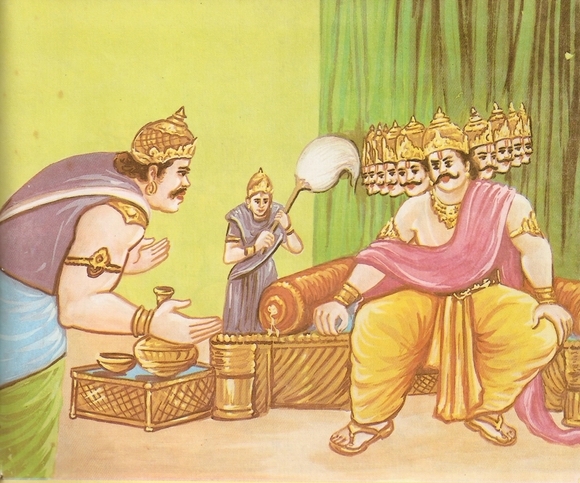 The messenger told Khara all what Ram had said. So, both the demon brothers attacked Ram with a 1400-strong force of demons. 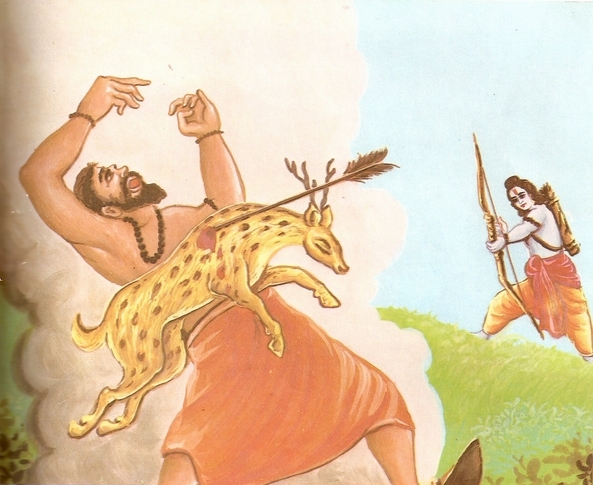 But Ram made short work of them all except one demon named Akampan, who fled away to save his life. Khara and Dushan were killed in the action too. Ram’s victory over the demons of Panchvati made the people living there quite safe and fearless. They had seen the battle between Ram and the demons. But when they saw that the demons started killing one another, they came to believe that it was a miracle on the part of Ram. 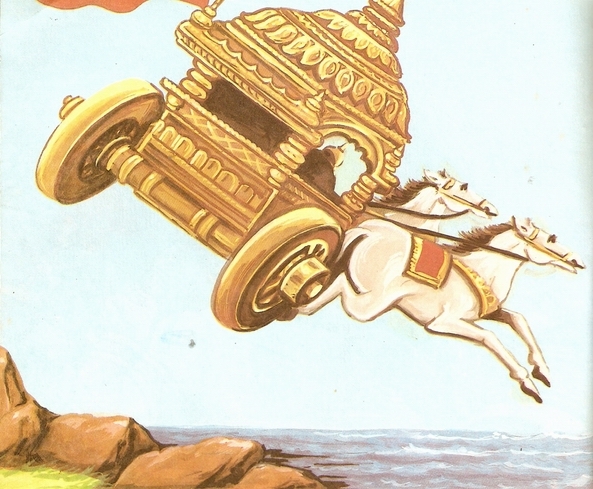 Akampan proceeded towards the South in his aerial Chariot. 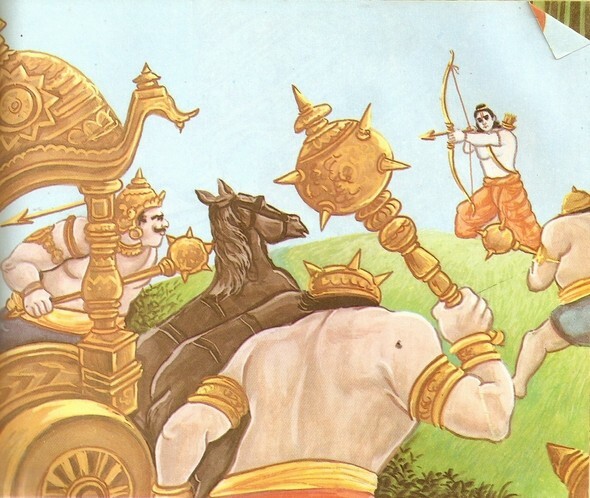 Ram saw him running from the battle-field, but did not shoot an arrow at him out of pity. 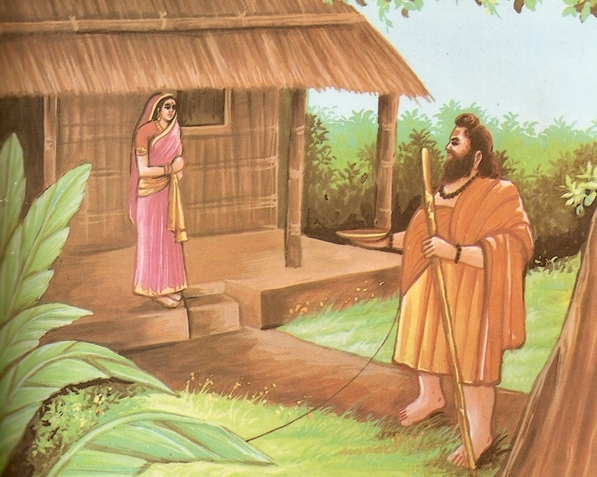 Meanwhile Lakshmana came out of the cave along with Sita. They returned to their hut. 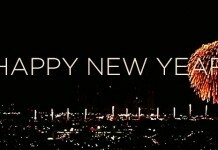 “All right! I must do it then. I shall go to Mareech for help.” Saying so, Ravana adjourned his court and went to his palace. “I agree with you, Mareech.” Saying so Ravana got up. “Go and rule in peace. 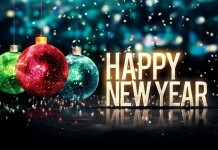 Enjoy your stately comforts and give up the idea of enmity with Ram for ever. It is essentially good for you and for the welfare of your clan,” said Mareech to Ravana who returned to Lanka. Hearing these words, Ravana again flew into a rage and said, “You are right, sister. I must go to Mareech for help.” Saying so, he returned to Mareech. “Listen, then. You have got to change yourself into a deer so that Ram feels allured to follow you and kill you. In his absence, I shall carry away Sita. Mind that if you did not help me, I shall sever your head from your body just now,” said Ravana. 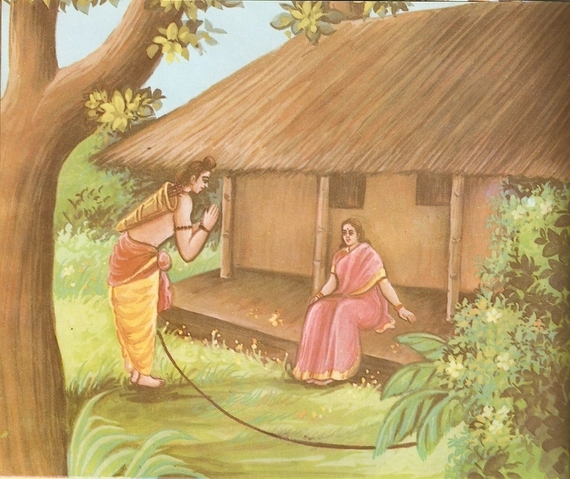 Lakshmana was in a fix but Sita compelled him to leave the hut . So Lakshmana drew a circle round the hut and said, “Dear sister-in-law-! Never come out of this line. I am going to look for my brother.” Saying so, he proceeded into the forest. 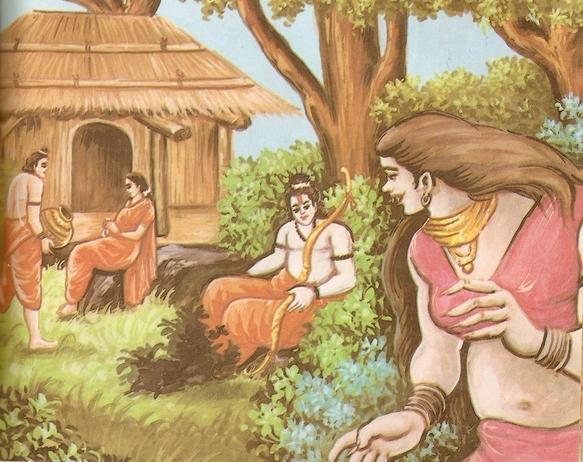 Finding Sita alone, Ravana changed himself into a saint and went near the hut. Looking hither and thither, he advanced towards the hut with a view to begging alms. But when he got near the circle, he was startled. As soon as his foot touched the line, a fearful fire broke out of it. He withdrew his step at once and said, “Gentle lady! We don’t accept bound alms. If you are to give me something, come out of this circle otherwise I shall return empty –handed. “I am Ravana, the king of Lanka.” Saying so, he came to his real form. “I am Ravana, the ruler of Lanka. I’ll see who dares to come and rescue you from my grips,” said Ravana. “Brother! We heard your cry for help. 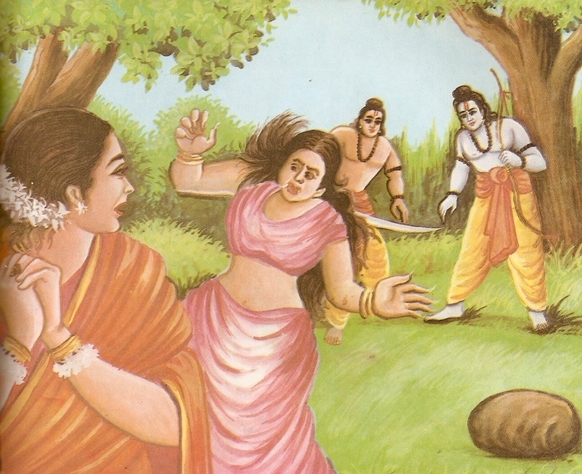 I had to come to your help on Sita’s insistence,” retorted Lakshmana. 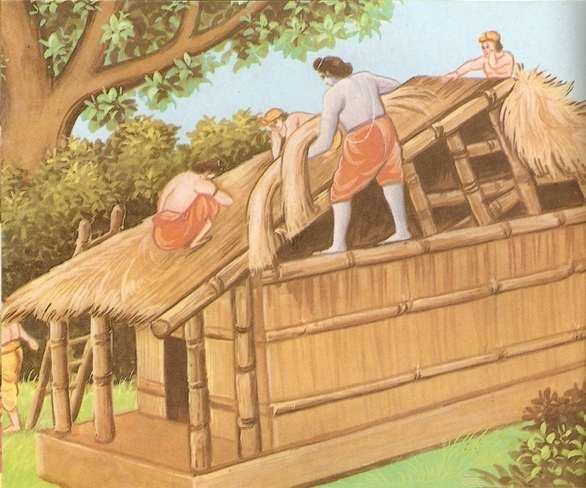 Ram and Lakshmana came to the hut but they found no sign of Sita there. They felt worried and went about looking for her but all of no avail. Ram felt extremely unhappy. So Lakshmana said, “Don’t lose hope so soon, Brother. She might have gone into the forest or to the river. 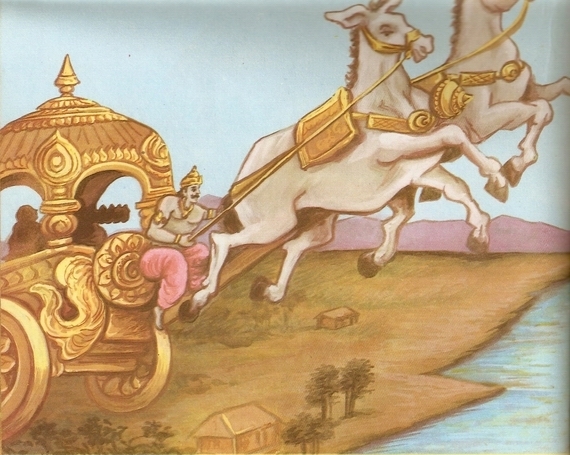 Let us go and see.” Saying so Lakshmana, along with Ram, went southwards looking for Sita. Going over a considerable distance, they found Jatayu lying half dead on the ground. They ran to him and recognised him. He said, “Lakshmana! He is Jatayu, our father’s friend.” Saying so, both the brothers sat beside the dying vulture. 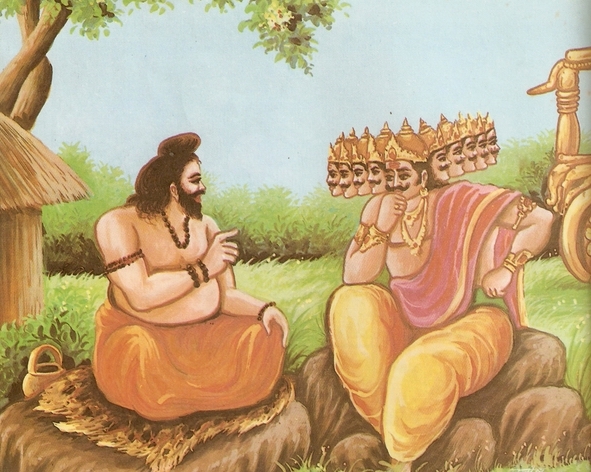 Then Ram asked, “Where has Ravana taken Sita to? Let me know at once,” “That I don’t know,” retorted Jatayu. “Who is the Ravana, after all. Let me know,” asked Ram. Jatayu was just on the verge of death. So he could speak a few words with difficulty. 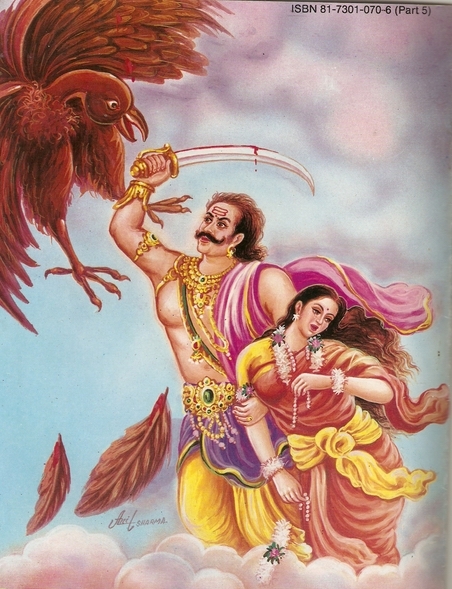 He said, “Ravana is the king of demons and Vishrava’s son.” Saying so, Jatayu breathed his last in Ram’s lap. 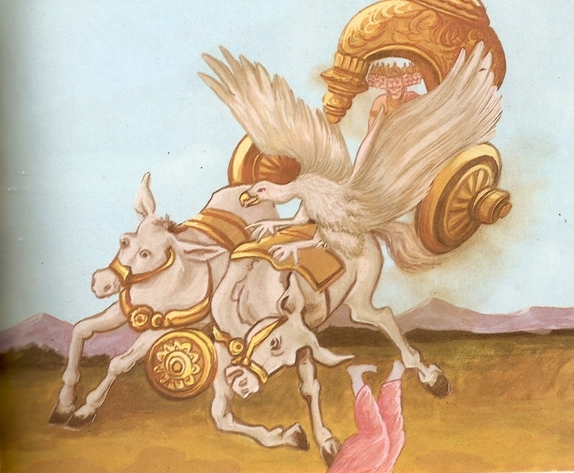 Jatayu’s death made Rama even more restless. He said, “I salute you again and again, O Great Vulture. I revere you as much as I do my father.” After it, both the brothers performed the last rites of Jatayu. 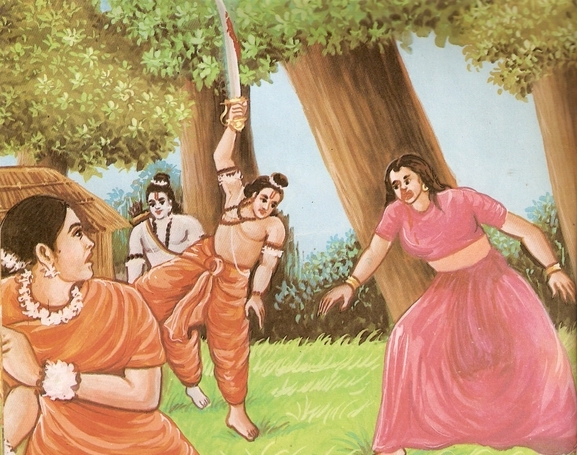 Ram and Lakshmana moved on and on in search of Sita and finally reached the Kronch Forest where a demon caught them. Before Ram could answer, the demon opened his mouth wide to devour them up. Ram drew out his sword and cut off the hands of the demon. 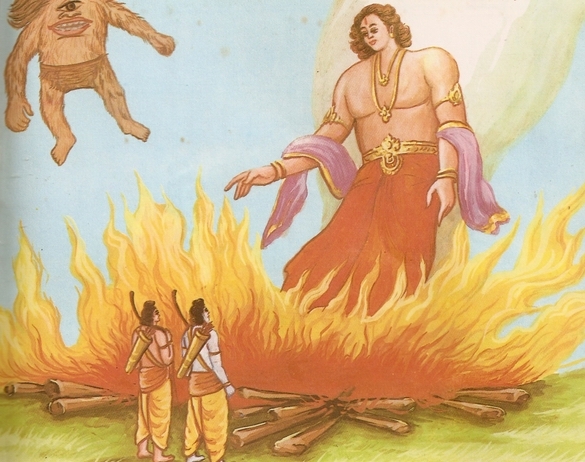 Then both the brothers attacked him, killed him and burnt him to ashes. “I’ll let you know the way to find out Sita. Please locate Sugreeva – the ruler of the Banaras. He will help you to locate and rescue Sita.” Saying so, Kabandh disappeared. Both the brothers reached the western bank of the Pampa Lake. There they were received and entertained by a saintly old lady, Shabri by name. She was an old lady belonging to a jungle tribe. 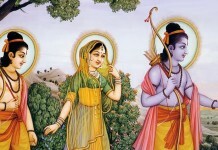 Seeing both the brothers coming towards her, she said, “My long –cherished desire is going to be fulfilled, Ram. I had been alive for this happy occasion only.” Saying so, she went into the forest to bring wild-berries for Ram and Lakshmana. “These are the sweetest fruits on the earth, Lakshmana,” Saying so, Ram enjoyed them tastily though Lakshmana stealthily threw them away. Shabri breathed her last that very day.